KHARTOUM: A Sudanese emergency court has sentenced nine women protesters to 20 lashes each for participating in an unauthorized demonstration against President Omar Al-Bashir’s rule, defense lawyers said. 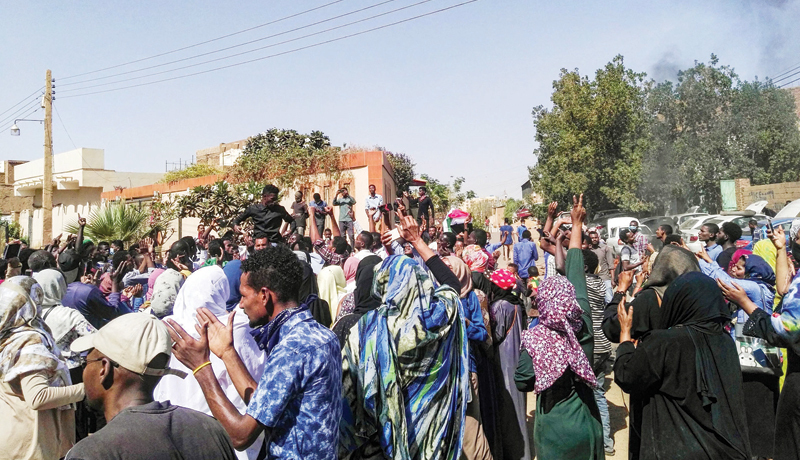 The ruling by the Khartoum court came despite Bashir on Friday ordering the release of all female detainees held during nationwide demonstrations that have rocked the country since December. The authorities have set up special emergency courts to investigate violations of a nationwide state of emergency imposed by Bashir on February 22 to end the demonstrations after an initial crackdown failed to suppress the protest movement. The nine women protesters were taken to court after they were arrested on Thursday for participating in a “banned demonstration” earlier that day in the capital’s eastern district of Burri, a site of regular protests. “Nine women protesters have been sentenced to one month jail and 20 lashes,” defense lawyer Enaam Atieg told AFP. “They have been taken to women’s prison in Omdurman,” she said, referring to the twin city of the capital across the Nile. Atieg said an appeal against the court’s verdict was filed yesterday. A lawyers’ group that is part of the protest movement also confirmed the sentencing. “Following pressure from their lawyers the court has still not implemented the floggings,” the Democratic Lawyers Alliance said in a statement. Activists and rights groups have regularly complained about Sudan’s selective application of Islamic sharia law, with hundreds of women sentenced to flogging under a controversial public order law. Saturday’s ruling was not the first against protesters since special emergency courts were established. Eight men accused of participating in a rally were handed jail terms ranging from six months to five years on March 1 in the first such penalties by the special courts. An emergency appeals court on Thursday overturned that decision and freed the eight protesters. On Friday, Bashir ordered the release of all women detainees held during the demonstrations since they erupted last year, in a move that coincided with International Women’s Day.